Although there are plenty of instances in which a third hand would come in, uh, handy, having a spare one to steadily tote around your wine glass while you're busy greeting people and stuffing your face with hors d'oeuvres at parties very much nears the top of the list. Fortunately, there's no need to conduct any weird limb-cloning to get the same effect, because this ingenious wine glass necklace has you covered. This cleverly engineered accessory from the vino-loving team at WineYoke is designed to let you carry around any stemmed glass hands-free, keeping it snugly nestled in a rubberized neoprene sleeve safely across your chest. 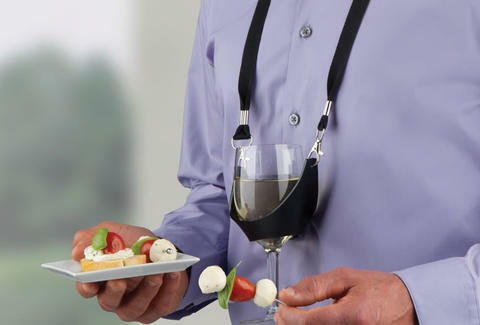 It's also equipped with an adjustable strap, so it'll suit multitasking wine fiends of all shapes and sizes -- even kids! (Parenting pro-tip: don't give your kids wine or let them run around with glass strapped to their chests). And while most reviews of it on Amazon are extremely positive, if you plan to be rowdy with it on, you'd be wise to stick to a short-pours of a white varietal or find a glass with a lid, because unless you're a human gyroscope, you're going to spill.